THERE IS A BRIGHT NEW STAR IN THE SKY OVER AFRICA. A new face has emerged within conservation circles in southern Africa. It is an NGO called the True Green Alliance (TGA). Its purpose is to create a properly informed public and it preaches the principles and practices of science-based wildlife management (a.k.a. ‘conservation’). One of its goals is to convince people in the public domain about the need to wisely and sustainably utilise our living resources – both wild and domestic – for the benefit of mankind. It is opposed by a well-established – and often well-heeled – force of animal rightists and animal rights NGOs, whose purpose in life is to abolish all animal uses by man. And both sides, in the war that is being fought between these two ideologies, take no prisoners. The TGA supports South Africa’s wildlife industry – its game ranchers; its game breeders; its private rhino owners; its hunters; and the trophy hunting safari business. It promotes responsible and sustainable wildlife management practices in our national parks and nature reserves; and it encourages sustainable eco-tourism. It has undertaken not to play an active role in the domestic affairs of the wildlife industry preferring to let its own experts resolve whatever differences might, from time to time, arise. The TGA’s sole purpose is to counteract the negative effects that animal rights propaganda has on the industry and, to do that, it has to also create a properly informed public – so it operates principally within the public domain. 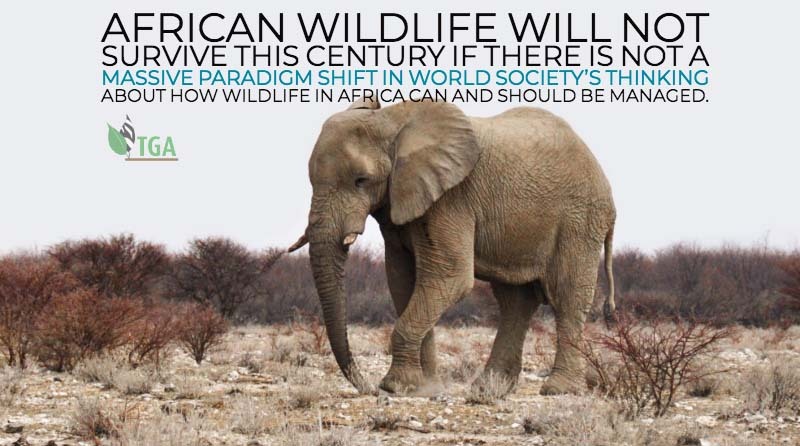 The TGA believes that African wildlife will not survive this century if there is not a massive paradigm shift in world society’s thinking about how wildlife in Africa can and should be managed. United Nations figures tell us that, today, there are some 750 million people living in Africa south of the Sahara Desert; and that by the turn of the century that number will have exceeded 4 billion. The TGA, therefore, is of the opinion that, if by 2100, our conservation efforts have not properly integrated the needs of Africa’s rural people with the needs of Africa’s wildlife and its national parks, there will be nothing left to conserve. The organisation, therefore, encourages governments, and society-at-large, to support and to pursue this integration imperative with vigour. The animal rights movement world-wide is financially very powerful and it opposes everything that the TGA is trying to achieve. Animal rights proponents project the idea that ‘total preservation’ is the only way to save Africa’s wildlife; and that whenever a price-tag is hung around a wild animal’s neck, or when wildlife products, like ivory and rhino horn, are given a high monetary value, society places the species concerned on the slippery slope to extinction. The TGA counters these arguments by pointing out that the most utilised animals on earth are domestic stock; that since biblical times, cattle, sheep and goats have commanded very high prices; and that none of these animals have become extinct as a consequence. The reason for this, the TGA insists, is because man and his civilization depend on these animals for survival. Mankind, therefore, cannot afford to allow any of these animals to become extinct. In this regard, man has forged an integrated partnership with his domestic stock in a system of mutual survival that benefits both sides of the symbiotic coin; and that is why neither man nor his domestic stock have yet disappeared off the face of the earth. The purpose of the TGA pushing for the needs of Africa’s rural people to be integrated with the needs of Africa’s wildlife and national parks, the CEO of the organisation states, is to create a state of symbiosis between man and his wildlife – similar to that which already exists between man and his domestic stock. The fight for supremacy over these kinds of issues is not being fought within the realms of either the wildlife industry or government, but within the public domain. It is a battle to win the hearts and minds of society because both sides know that it is public opinion that will eventually determine which side will win this war and which will lose it. And, for Africa and Africa’s people, the stakes are very high. The above is a short article that I wrote and submitted to South Africa’s online newspaper, the Daily Maverick, which has a reach of nearly 100 000 readers on every issue. It contains important information that needs to be exposed to as many South Africans as possible. Hence the duplication! It is also a good foundation on which to construct the Armageddon 18 article. The TGA is fighting a war against animal rightsism on behalf of all southern Africa’s wildlife industries and hunters – for the right to sustainably utilise our wild living resources as we see fit; and in the long term interests of Africa’s people. It often seems to me that I am fighting this battle single-handedly because it involves hours and hours of banging away at a keyboard in front of a very bright computer screen. But that is not so. The TGA had a stalwart board of highly experienced directors who all work just as hard as I do; and they encourage me all along the way – which I cannot do without. And the TGA is making huge inroads within the public domain. Nevertheless, for every gain there seems to be a counteracting loss. The TGA’s website and Facebook social media outlets are of the highest standard, and the organisation has a very active, mature and knowledgeable web-mistress running the show for us. Our posting of ‘The Truth About Cecil the Lion’, for example – which exposed the lies in the animal rights propaganda concerning this controversy – received over 90 000 public interactions within the first three days of its showing – and the public conversation on this issue continues. Our collective public interactions exceed those of the International Union for the Conservation of Nature (IUCN) and the European based International Council for Game and Wildlife Conservation (C.I.C.). So it has been doing very well – and it is getting the TGA’s message out loud and clear to people in the public domain. But now the TGA finds itself fighting Facebook. Over the last couple of months, the True Green Alliance Facebook has twice been banned – for several weeks – from sharing to ‘Groups’ and sharing from ‘Groups’. And our administrator has even been banned from commenting on other ‘Groups’ posts. Facebook has three products: Profiles; Groups and Pages. And we are allowed to belong to 6000 Groups. The banning orders, therefore, have been a negative for us because our ratings have plunged. It appears that what we have been publishing – promoting the sustainable use of our wildlife resources for the benefit of mankind (including the promotion of hunting as a wildlife management tool), and denouncing the animal rights doctrine – the purpose of which is to abolish all animal uses by man – has met with a high measure of disapproval from the administrators at Facebook. As everybody who understands the TGA will tell you, what the organisation projects on its social media platform is legal and official information that is totally in-line with South Africa’s National Conservation Strategy (NSC). And South Africa’s NCS is, itself, based upon the World Conservation Strategy (WCS) of 1980 – which is the mission statement of that august international conservation body called the IUCN (The International Union for the Conservation of Nature and Natural Resources). Furthermore, in 1980, when the WCS was promulgated, the whole world praised the protocol proclaiming that it represented a blue print for the survival of both man and nature, working in symbiotic harmony, into posterity. And all responsible nations of the world obligated themselves to design their new National Conservation Strategies on the WCS template. South Africa was one of those responsible states that did just this. What has changed since 1980, to turn the world so against the World Conservation Strategy? What has changed is the evolution of a massive and fraudulent animal rights brigade that repudiates all the provisions of the WCS; that rejects the concept of sustainable use of the earth’s living resources for the benefit of mankind; that projects wild animals to be sacred cows that must be protected from all harm at all cost; and that now pursues dogmatic policies to destroy every idea that was ever promoted by the WCS. And all this has happened in the last 37 years! What the animal rightists fail to see is that if man does not practice the sustainable use of his food resources, man as a species, will render himself extinct. And that reality applies to man the carnivore, like me – who loves his barbecued steak – as it does to man the vegan; because if vegans do not eat from vegetable crops that are harvested and managed in a sustainable manner, they too, will disappear into antiquity. So the staunch vegans – the hard-boiled leaders of the animal rightist packs – cannot point fingers at those of us who eat meat and blame our killing behaviour as being the cause of wild animal extinctions, because extinctions will occur within any animal species if it runs out of food when the rate of its harvest becomes unsustainable. The fact is that the harvest of any living resource – plant or animal, wild or domestic – is totally acceptable if it is sustainable. So why are the animal rightists so against the provisions of the World Conservation Strategy – and so pro the animal rightists’ doctrine – when all this common sense rationale is so understandable? The reason is MONEY. Objections to the killing of animals is just a subterfuge. The NGOs really couldn’t care a damn about the animals! They use the emotional connotations associated with hunters killing a wild animal – like Walt Disney used Bambi for the same reasons – in order to conjure up support amongst the naïve, uninformed and gullible urban publics of the First World – who have become totally detached from nature – to convince them to donate the funds that the NGOs need to run their lavish organisations. None of the money so raised, goes towards whatever the cause that was used to solicit the monies in the first place. That makes the raising of these funds a fraudulent activity; and when such a scam is used more than once, the crime becomes ‘racketeering’ – which, according to the American RICO Act, is one of thirty-five other such offences that constitute ‘organised crime’. The RICO Act (Racketeering Influenced and Corrupt Organisations Act) is a United States federal law that provides for extended criminal penalties and a civil cause of action for acts performed as part of organised crime. I look upon each and every animal rights organisation in the United States, therefore, as being part of a syndicate that constitutes organised crime. And every year the members of this syndicate annually extract from the innocent and caring public, hundreds of millions of US dollars. MONEY is their life blood! So now you know what the animal rights brigade is all about! The WCS supports the sustainable utilisation of the earth’s living resources – both wild and domestic – for the benefit of mankind; and it points out that the only way nature is going to survive into posterity, the onslaught of the world’s burgeoning human population explosion, is by creating situations of symbiosis between man and nature. That, in a nutshell, means that man must utilise the resources of nature in a sustainable manner and in such a way that he becomes dependent on those resources for his survival. Only when man achieves that level of survival dependency, will he make absolutely sure that those elements of nature on which he depends, will never be threatened by over-utilisation. To do that would be suicidal for mankind. Fighting the animal rightists, therefore, is a never-ending battle which has, we are discovering, hundreds and hundreds of different facets. And now, totally unexpectedly, we have Facebook fighting against us. This leaves us in a quandary. Are we to believe that the Facebook administration in America is animal rightist in orientation – and that when they saw that our Facebook being so active, they decided, arbitrarily, to shut it down? Or are there maverick individuals within the Facebook institution doing this of their own accord? Or has the well-heeled animal rights brigade paid individuals, or the management, a handsome reward for shutting us down? Whatever the reason these activities are ultra vires America law; and it violates the American Constitution. Other people and organisations on Facebook, have been banned by the Facebook management in exactly this same way. These include, people within South Africa, people in the United States, and people in Zimbabwe. They all have one thing in common, however, they are all paid-up members of the TGA and they all interact with our Facebook postings. And there are probably many more that we don’t know about. So there is no doubt in my mind that the TGA has been their special target. 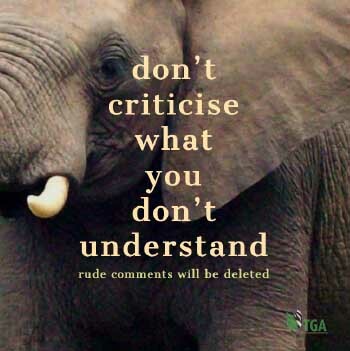 What the TGA is confronted with, therefore, is an unacceptable situation where Facebook have seemingly taken it upon themselves to restrict our right to freedom of speech; to restrict our right to properly inform the general public about perfectly legal and accepted principles and practices of science-based wildlife management – all contained and accepted within the legal framework of our South African National Conservation Strategy; and to inform the public about the illegal activities of foreign animal rights activists who are dead set on destroying our national endeavours to institute ‘best practice’ wildlife management programmes on our own national wildlife assets. NB: The TGA is negotiating with some of its American friends to take legal action against Facebook for its blatantly unconstitutional actions. This banning action by Facebook leaves the international animal rights brigade – all part and parcel of an organised international wildlife crime ring, the extent of which has never been known in the history of the world – with an open sesame to disseminate their false propaganda. And their propaganda has nothing to do with what is best for Africa’s wild animals but everything to do with how much money the NGOs can make out of a gullible public. The foreign individuals and NGOs who thus force their demands on Africa – through their adroit use of the Convention on International Trade in Endangered Species (CITES) – which they have corrupted – have no knowledge about the proper and scientific management of the animals that they purport to care so much about; have no accountability for the results of the management actions, good or bad, that they demand should be taken; and who have no idea of (or consideration for) the plans that the range-state governments might have with regard to integrating the needs of their rural people, with the needs of the wildlife and national parks in their care. The animal rightists couldn’t care a damn about any such niceties. And they may believe that they have the TGA’s social media network dead in the water. But they are wrong. They have yet to learn that only dead fish flow with the tide!